She had a mighty large stack going until I told her we had to add it all up and see how much it really was. She had a gift card from her mom plus the money from me. She had to make tough decisions on what to put back and what to keep. It was really kind of funny to watch the wheels turning in her head. My sister said she was just beaming all the way back home. I know it made my day! Saturday morning I got up to get in my last long run before my half marathon next weekend. It was really gloomy looking. Gray skies, gusting winds. It started off around 55 degrees, but the temps were dropping and it was 52 when I finished. I should have worn short sleeves and gloves. I ended up getting a little warm with shorts and a long sleeved top, but my hands were numb from the wind. I tried to wave back to someone at one point and could barely open my fingers into a normal wave. Despite the weather, it turned out to be a good run for me. I did have to change up my route just a bit. The Susan G Komen Race for the Cure was going on. I could hear the festivities from where I was. This particular race is one of their largest. It's really amazing, emotional, awe-inspiring. While I didn't run this year, I did go through the names of people I know that have had breast cancer. My own little tribute. I also headed towards the river to one of the bridges so that I could look out as they were crossing over another of the bridges. Very awesome sight to see and gave me energy for the last few miles of my 12-miler. After the run, I had to get ready quickly. I didn't have time to properly stretch and then was stuck in the car for an hour. Ouch. We were going to see my nephew's football game. This is his first year playing and he's really enjoying it. Luckily, the skies cleared and it ended up being a simply gorgeous day. You know those fall days where the sky is crisp? Yep. That's how it was. Beautiful. It was nice getting to see my sister and the kiddos twice in one weekend. My dad and stepmom were also at the game, so that was a bonus. And if you want fun entertainment, go watch a tag football game for 5-7 year-olds. Hilarious! They're just running all over the place trying to figure out what to do. Sometimes the coaches actually picked them up and repositioned them in the line ups. There was one kid out there, though, that was GOOD. This boy will be playing one day for sure. I need to remember his name so I can be that person who says, "I remember when he was just playing tag football." By the time we got back home, I was about ready to eat my arm off so we stopped for pizza. Re-carbing right? The rest of the day was pretty laid back. 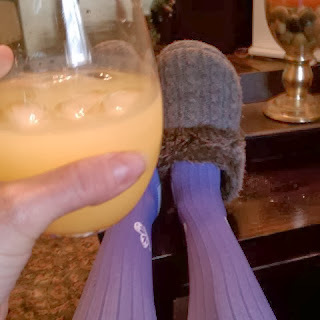 I propped my feet up with a mimosa. Perfect recovery drink I do believe. Sunday Jason had his long run to tackle. It was 41 degrees out. We were being babies about it, so we decided to tackle filing bills, paperwork, shredding while it warmed up a bit. I ended up doing 7.3 miles with him before heading back to the house to stretch and roll out. He went on and finished 12. The day was beautiful again. I sat out on the patio and read for a bit while he was running then getting cleaned up. We decided to have lunch on a patio. It's important to enjoy this weather while we have it right?